Berlin is the caipital ceety o Germany an is ane o the 16 states o Germany. Wi a population o 3.45 million fowk, Berlin is Germany's lairgest ceety. It is the seicont maist populous ceety proper an the seivent maist populous urban aurie in the European Union. The origin o the name Berlin is uncertain. It mey hae its ruits in the leid o Wast Slavic indwallers o the aurie o the day's Berlin, an mey be relatit tae the Auld Polabian stem berl-/birl- ("swamp"). Folk etymology connects the name tae the German wird for beir, Bär. A beir an aa appears in the coat o airms o the ceety. The earliest evidence o settlements in the aurie o the day's Berlin are a widden rod datit frae approximately 1192 an leftowers o widden hoosepairts datit tae 1174 foond in a 2012 diggin in Berlin Mitte. The first written records o touns in the aurie o present-day Berlin date frae the late 12t century. Spandau is first mentioned in 1197 an Köpenick in 1209, althou thir auries did nae jyn Berlin till 1920. The central pairt o Berlin can be traced back tae twa touns. Cölln on the Fischerinsel is first mentioned in a 1237 document, an Berlin, athort the Spree in what is nou cried the Nikolaiviertel, is referenced in a document frae 1244. The umwhile (1237) is considered tae be the foondin date o the ceety. The twa touns ower time formed close economic an social ties. In 1307 thay formed an alliance wi a common external policy, thair internal admeenistrations still bein separatit. In 1415, Frederick I acame the elector o the Margraviate o Brandenburg, which he ruled till 1440. During the 15t century his successors wad establish Berlin-Cölln as caipital o the margraviate, an subsequent members o the Hohenzollern faimily ruled till 1918 in Berlin, first as electors o Brandenburg, then as keengs o Proushie, an eventually as German emperors. In 1443, Frederick II Airntuith stairtit the construction o a new ryal palace in the twin ceety Berlin-Cölln. The protests o the toun ceetizens against the biggin culminatit in 1448, in the "Berlin Indignation" ("Berliner Unwille"). This protest wis nae successfu, houever, an the ceetizenry lost mony o its poleetical an economic privileges. Efter the ryal palace wis finished in 1451, it gradually came intae uise. Frae 1470, wi the new elector Albrecht III Achilles, Berlin-Cölln acame the new ryal residence. Offeecially, the Berlin-Cölln palace acame permanent residence o the Brandenburg electors o the Hohenzollerns frae 1486, when John Cicero came tae power. Berlin-Cölln, houiver, haed tae gie up its status as a free Hanseatic ceety. In 1539, the electors an the ceety offeecially became Lutheran. Frederick the Great (1712–1786) wis ane o Europe's enlichtened monarchs. The Thirty Years' War atween 1618 an 1648 devastatit Berlin. Ane third o its hooses war damaged or destroyed, an the ceety lost hauf o its population. Frederick William, kent as the "Great Elector", that haed succeedit his faither George William as ruler in 1640, initiatit a policy o promotin immigration an releegious tolerance. Wi the Edict o Potsdam in 1685, Frederick William offered asylum tae the French Huguenots. Bi 1700, approximately 30 percent o Berlin's residents war French, acause o the Huguenot immigration. Mony ither immigrants came frae Bohemie, Poland, an Salzburg. Syne 1618, the Margraviate o Brandenburg haed been in personal union wi the Duchy o Proushie. In 1701, houever, the dual state formed the Kinrick o Proushie, as Frederick III, Elector o Brandenburg nou crouned himsel as keeng Frederick I in Proushie. Berlin acame the caipital o the new Kinrick. This wis a successfu attempt tae centralise the caipital in the very ootspread state, an it wis the first time the ceety began tae grow. 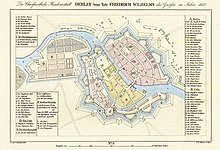 In 1709 Berlin merged wi the fower ceeties o Cölln, Friedrichswerder, Friedrichstadt an Dorotheenstadt unner the name Berlin, "Haupt- und Residenzstadt Berlin". In 1740, Frederick II, kent as Frederick the Great (1740–1786), came tae pouer. Unner the rule o Frederick II, Berlin acame a centre o the Enlichtenment. Follaein Fraunce's veectory in the War o the Fowert Coaleetion, Napoleon Bonaparte mairched intae Berlin in 1806, but grantit sel-govrenment tae the ceety. In 1815, the ceety acame pairt o the new Province o Brandenburg. 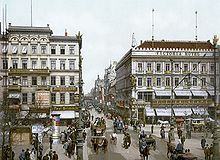 The Industrial Revolution transformed Berlin during the 19t century; the ceety's economy an population expandit dramatically, an it acame the main railwey hub an economic centre o Germany. Addeetional suburbs suin developed an increased the aurie an population o Berlin. In 1861, neighborin suburbs includin Wedding, Moabit an several ithers war incorporatit intae Berlin. In 1871, Berlin acame caipital o the newly foondit German Empire. In 1881, it acame a ceety destrict separate frae Brandenburg. In the early 20t century, Berlin haed acome a fertile grund for the German Expressionist movement. In fields such as airchitectur, pentin an cinema new forms o airteestic styles war inventit. At the end o Warld War I in 1918, a republic wis proclaimed bi Philipp Scheidemann at the Reichstag biggin. In 1920, the Greater Berlin Act incorporatit dozens o suburban ceeties, veelages, an estates aroond Berlin intae an expandit ceety. The act increased the aurie o Berlin frae 66 tae 883 km2 (25 tae 341 sq mi). The population almaist doubled an Berlin haed a population o aroond fower million. During the Weimar era, Berlin unnerwent poleetical unrest due tae economic uncertainties, but an aa acame a renained centre o the Roarin Twenties. The metropolis experienced its heyday as a major warld caipital an wis kent for its leadership roles in science, technology, the humanities, ceety plannin, film, heicher eddication, govrenment, an industries. Albert Einstein rose tae public prominence during his years in Berlin, bein awairdit the Nobel Prize for Pheesics in 1921. 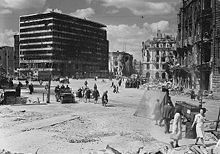 Berlin in ruins efter Warld War II (Potsdamer Platz, 1945). In 1933, Adolf Hitler an the Nazi Pairty came tae pouer. NSDAP rule effectively destroyed Berlin's Jewish community, which haed nummered 160,000, representin ane-third o aw Jews in the kintra. Berlin's Jewish population fell tae aboot 80,000 as a result o emigration atween 1933 an 1939. Efter Kristallnacht in 1938, thoosands o the ceety's persecutit groups war imprisoned in the nearby Sachsenhausen concentration camp or, stairtin in early 1943, war shipped tae death camps, such as Auschwitz. During Warld War II, lairge pairts o Berlin war destroyed in the 1943–45 air raids an during the Battle o Berlin. Aroond 125,000 ceevilians war killed. Efter the end o the war in Europe in 1945, Berlin received lairge nummers o refugees frae the Eastren provinces. The victorious pouers dividit the ceety intae fower sectors, analogous tae the occupation zones intae which Germany wis dividit. The sectors o the Wastren Allies (the Unitit States, the Unitit Kinrick an Fraunce) formed Wast Berlin, while the Soviet sector formed East Berlin. The Berlin Waw in 1986, pentit on the wastren side. Fowk crossin the sae-cried "death strip" on the eastren side war at risk o bein shot. Aw fower Allies shared admeenistrative responsibilities for Berlin. Houever, in 1948, when the Wastren Allies extendit the siller reform in the Wastren zones o Germany tae the three wastren sectors o Berlin, the Soviet Union imposed a blockade on the access routes tae an frae Wast Berlin, which lay entirely inside Soviet-controlled territory. The Berlin airlift, conductit bi the three wastren Allies, owercame this blockade bi supplyin fuid an ither supplies tae the ceety frae Juin 1948 tae Mey 1949. In 1949, the Federal Republic o Germany wis foondit in Wast Germany an eventually includit aw o the American, Breetish, an French zones, excludin those three kintras' zones in Berlin, while the Marxist-Leninist German Democratic Republic wis proclaimed in East Germany. Wast Berlin offeecially remained an occupied ceety, but it poleetically wis aligned wi the Federal Republic o Germany despite Wast Berlin's geografic isolation. Airline service tae Wast Berlin wis grantit anly tae American, Breetish, an French airlines. The faw o the Berlin Waw on 9 November 1989. 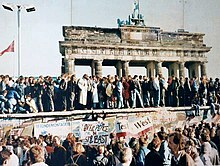 On 3 October 1990, the German reunification process wis formally finished. The foondin o the twa German states increased Cauld War tensions. Wast Berlin wis surroondit bi East German territory, an East Germany proclaimed the Eastren pairt as its caipital, a muiv that wis nae recognised bi the wastren powers. East Berlin included maist o the historic centre o the ceety. The Wast German govrenment established itsel in Bonn. In 1961, East Germany began the biggin o the Berlin Waw atween East an Wast Berlin, an events escalatit tae a tank staundoff at Checkpoint Charlie. Wast Berlin wis nou de facto a pairt o Wast Germany wi a unique legal status, while East Berlin wis de facto a pairt o East Germany. John F. Kennedy gae his "Ich bin ein Berliner" – speech in 1963 unnerlinin the US support for the Wastren pairt o the ceety. Berlin wis completely dividit. Althou it wis possible for Wastreners tae pass frae ane tae the ither side throu strictly controlled checkpynts, for maist Eastreners traivel tae West Berlin or Wast Germany wis prohibitit. 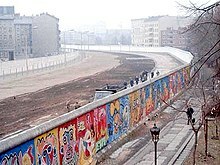 In 1971, a Fower-Pouer agreement guaranteed access tae an frae Wast Berlin bi caur or train throu East Germany. In 1989, wi the end o the Cauld War an pressur frae the East German population, the Berlin Waw fell on 9 November an wis subsequently maistly demolished. The day, the East Side Gallery preserves a lairge portion o the Waw. On 3 October 1990, the twa pairts o Germany war reunified as the Federal Republic o Germany, an Berlin again acame the offeecial German caipital. In 1991, the German Pairlament, the Bundestag, votit tae muive the seat o the (Wast) German caipital frae Bonn tae Berlin, which wis completit in 1999. Berlin's 2001 admeenistrative reform merged several destricts. The nummer o boroughs wis reduced frae 23 tae 12. In 2006, the FIFA Warld Cup Final wis held in Berlin. Cairt o Berlin's twal burghs an thair localities. Berlin is subdividit intae twal burghs (Bezirke), doun frae 23 burghs afore Berlin's 2001 admeenistrative reform. Each borough contains a nummer o localities (Ortsteile), which aften hae historic ruits in aulder municipalities that predate the formation o Greater Berlin on 1 October 1920 an became urbanized an incorporatit intae the ceety. Mony residents strangly identifee wi thair localities or burghs. At present Berlin consists o 95 localities, which are commonly made up o several ceety neighborhuids—cried Kiez in the Berlin dialect—representin sma residential auries. Each burgh is govrened bi a burgh cooncil (Bezirksamt) consistin o five cooncilors (Bezirksstadträte) an a burgh mayor (Bezirksbürgermeister). The burgh cooncil is electit bi the burgh assembly (Bezirksverordnetenversammlung). The burghs o Berlin are no independent municipalities, housomeivver. The pouer o burgh govrenments is limitit an subordinate tae the Senate o Berlin. The burgh mayors form the cooncil o mayors (Rat der Bürgermeister), led bi the ceety's govrenin mayor, which advises the senate. The localities hae nae local govrenment bodies, an the admeenistrative duties o the umwhile locality representative, the Ortsvorsteher, wur taken ower bi the burgh mayors. Berlin maintains offeecial pairtnerships wi 17 ceeties. Town twinnin atween Berlin an ither ceeties began wi Los Angeles in 1967. East Berlin's pairtnerships wur canceled at the time o German reunification an later pairtially reestablished. Wast Berlin's pairtnerships haed previously been restrictit tae the borough level. Durin the Cauld War era, the pairtnerships haed reflectit the different power blocs, wi Wast Berlin pairtnerin wi caipitals in the Wast, an East Berlin maistly pairtnerin wi ceeties frae the Warsaw Pact an its allies. ↑ "Amt für Statistik Berlin Brandenburg". Amt für Statistik Berlin-Brandenburg (in German). 2014. Retrieved 5 March 2015. ↑ Prefixes for vehicle registration wur introducit in 1906, but aften chyngit due tae the poleetical chynges efter 1945. Vehicles wur registered unner the follaein prefixes: "I A" (1906– Aprile 1945; devalidatit on 11 August 1945); no prefix, anerlie digits (syne Julie till August 1945), "БГ" (=BG; 1945–1946, for caurs, lorries an busses), "ГФ" (=GF; 1945–1946, for caurs, lorries an busses), "БМ" (=BM; 1945–1947, for motor bikes), "ГМ" (=GM; 1945–1947, for motor bikes), "KB" (i.e. : Kommandatura of Berlin; for aw o Berlin 1947–1948, continued for Wast Berlin till 1956), "GB" (i.e. : Greater Berlin, for East Berlin 1948–1953), "I" (for East Berlin, 1953–1990), "B" (for Wast Berlin as o 1 Julie 1956, continued for aw o Berlin syne 1990). ↑ "Bruttoinlandsprodukt (nominal) in BERLIN seit 1995" (PDF) (in German). 30 March 2010. Retrieved 15 May 2011. ↑ Steven Somers (14 July 2008). Those Crazy Germans! : A Lighthearted Guide to Germany. Xlibris Corporation. p. 12. ISBN 978-1-4535-6595-7. ↑ "Spandau Citadel". Berlin tourist board. Archived frae the oreeginal on 12 June 2008. Retrieved 18 August 2008. ↑ "The Hohenzollern Dynasty". Antipas. Archived frae the oreeginal on 7 August 2007. Retrieved 18 August 2008. ↑ "Berlin Cathedral". SMPProtein. Archived frae the oreeginal on 18 August 2006. Retrieved 18 August 2008. ↑ Thomas Carlyle (1853). Fraser's Magazine. J. Fraser. p. 63. ↑ W. Paul Strassmann (15 June 2008). The Strassmanns: Science, Politics and Migration in Turbulent Times (1793-1993). Berghahn Books. p. 26. ISBN 978-1-84545-416-6. ↑ 36.0 36.1 "Berlin's international city relations". Berlin Mayor's Office. Retrieved 22 August 2010. This page wis last eeditit on 10 August 2018, at 16:38.